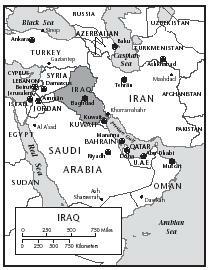 Iraq is located in southwestern Asia, in the heart of the Middle East. 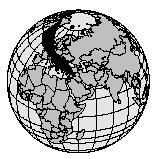 Its land area is comparable in size to California. There are four distinct land regions in Iraq. The Delta region is a broad plain in the southeast. To the west are the Steppe-Desert Plains, made up of sand and stony plains. The north region, between the Tigris and Euphrates Rivers, is a fertile area of grassy flatlands and rolling hills. The Zagros Mountains rise steeply in the northeast. The climate in Iraq is as varied as the different regions, ranging from tropical in the east and southeast, to dry and desert-like in the west. The north is pleasant during summer months and freezing in the winter months. On average, Iraq is a dry country, even in the fertile lands between the rivers. In the summer, a dry, dusty wind called the shamal blasts through the country with dust storms, lasting for several days. Since the country is so dry, there are few plants, except for the date palm, known for its fruit (dates). In fact, more than 80 percent of the world's date supply is grown in Iraq. Settled between the Tigris and Euphrates Rivers, the area known as Iraq today was called Mesopotamia up until the end of World War I (1914–1918). In ancient Greek, Mesopotamia translates to "land between rivers." The first human civilization (called Sumer) is thought to have flourished here around 4000 B.C. wheat, and barley. Grapes also grew plentifully and were used for wine. The native olive tree was valued for both its fruit and oil. Sumerian stone tablets dating to 2500 B.C. record the usage of figs, which when cooked, were used as sweeteners in place of sugar. Iraqi food is so strongly influenced by its neighboring countries, Turkey and Iran, it is one of the few nations of the Middle East to lack a unique cuisine. Like the Turks, Iraqis like to stuff vegetables and eat a lot of lamb, rice, and yogurt. Like Iranians, they enjoy cooking fruits with beef and poultry. In a frying pan, heat the oil and sauté the meat until browned. Add the prunes and cook on low, uncovered, for 20 minutes. Add the apples, apricots, seasonings, and tomato sauce. Stir well and cook uncovered for another 10 minutes. Serve hot over rice. Although Iraq may not have a distinct cooking style, there are several dishes native to the country. Masgoof is a whole-skewered fish barbequed on an outdoor grill. Iraqis cook almost every part of an animal, from the kidneys and liver, to the brain, feet, eyes, and ears. Pacha is a slowly cooked combination of sheep's head, stomach, feet, and other parts in a broth. A popular side dish, turshi, is a mixture of pickled vegetables. Wheat, barley, rice, and dates are the staple foods of Iraq. Sheep and goats are the most common meat, but lamb, cows, chickens, fish, and sometimes camels are eaten as well. The meat is usually cut into strips, then cooked with onions and garlic, or minced for stew and served with rice. For the majority of Iraqis who practice the Muslim religion (95 percent of Iraqis), eating pork is forbidden. Alcohol is also forbidden to Muslims, so Western soft drinks, ice water, tea, and coffee are drunk. Coffee and tea are served before and after, but never during, a meal. Iraqis usually drink their coffee with sugar and cream or milk. The rich, dark coffee prepared in Iraq is unique. The beans are ground, then heated and cooled nine times before the coffee is served. This is believed to remove all impurities from the imported coffee. The majority of Iraqis are Muslim, about 95 percent. Of those, 54 percent are Shi'ite , and 41 percent are Sunni. The difference between the Shi'ite and Sunni Muslims is a conflicting belief in authority dating back to the early history of the religion. The two groups, however, share the same Muslim beliefs and religious holidays. Date palm trees grow all over the Middle East. 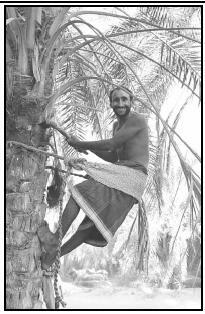 A picker climbs a date palm tree to harvest its tasty fruit. Mix with different nuts and chopped bananas for a snack. Cut up and use in cookie recipes in place of chocolate chips or raisins. The fast of Ramadan is celebrated the entire ninth month of the Muslim year. This means for the whole month, no food or water may be consumed from sunrise to sunset. Cooks (or people who are buying foods) may taste them, but they cannot be swallowed. Muslims believe fasting makes them stronger in their faith. They also believe it helps them understand how it feels to be poor and hungry. Families who can afford it slaughter a lamb and share the meat with the less fortunate. During Ramadan, Muslims rise before dawn to eat a meal called suhur (pronounced soo-HER). Foods containing grains and seeds, along with dates and bananas, are commonly eaten because they are considered slow to digest. This helps to ease hunger during the fast, which can be as long as 16 hours in the summer. At sunset, the day's fast is broken with iftar , a meal that traditionally starts with eating a date. The rest of the meal might include assorted mezze (appetizers) such as nuts or cooked fava beans, lentil soup, bread, and fresh fruit. In a pot, boil lentils in water for 15 minutes. Add the potatoes and continue cooking until both vegetables are tender. Heat the oil in a frying pan and fry garlic and coriander until slightly tender (about 5 minutes). Add mixture to pot of lentils and potatoes. Mix flour with water in a little bowl. Add this to the pot of lentil mixture. Cook 30 minutes on medium heat. Before serving, add lemon juice and season with salt and pepper. Serve hot or cold with pita bread. In a large pot, heat the butter over medium to high heat. Let soup cook for 45 minutes to 1½ hours, or until lentils are soft, stirring occasionally. Add more water if the soup thickens too much. Add lemon juice and cumin to taste (optional). Serve with pita bread. At the end of Ramadan comes a three-day festival called Eid al-Fitr. Friends and family gather to pray and share a large meal. In some cities, fairs are held to celebrate the end of the fast. Eating pork is forbidden to Muslims, but other meats such as beef, lamb, and fish are served on elegant platters. Other common dishes may include kebabs , yalanchi (spicy rice stuffing for eggplants or other vegetables), and ma'mounia , a dessert that dates from the 800s. 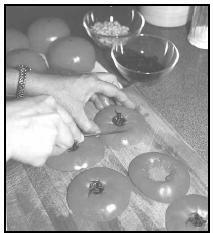 After cutting the tops from six tomatoes, remove the tomato stem and core. The remaining tops will be chopped and added to the stuffing mixture for Yalanchi (Tomatoes Stuffed with Rice). Cut a slice from the top of each tomato, about ¼- to ½-inch down. Cut the middle of the tops out (core) and finely chop the remaining tops. Scoop out tomatoes with a spoon and turn upside down on paper towels to drain. Throw the pulp and seeds away. Heat 2 Tablespoons oil in a large skillet over medium to high heat. Add onion and cook until soft, about 3 minutes. Stir frequently. Add chopped tomato tops, raisins, pine nuts, and cinnamon and mix well. Reduce heat to low and simmer, about 2 minutes. Remove from heat and add cooked rice. Season with salt and pepper and mix gently until well blended. Fill tomatoes with mixture and set side-by-side in a greased baking pan. Drizzle remaining oil on tomatoes so they are well greased. Bake in oven until tender but still firm, about 25 minutes. Serve warm or at room temperature for best flavor. Combine water and sugar in a large saucepan. Over low heat, stir constantly until sugar dissolves. Increase heat slowly to bring mixture to a boil (mixture will look like syrup). Add lemon juice. Reduce heat and simmer until syrup thickens, about 10 minutes. Set aside. In another saucepan, melt butter and add flour. Stir until lightly browned. Add the syrup from the other pan. Simmer mixture about 10 minutes, stirring constantly. Remove from heat and let cool 20 minutes. Spoon ma'mounia into bowls and top with whipped cream and cinnamon. Spread each pita lightly with butter. Top with a layer of jelly. Cut the pitas in half and serve. Khubaz is usually served as an accompaniment for salad. Hospitality is considered a highly admired asset to the Iraqis. Iraqis are known for being very generous and polite, especially when it comes to mealtime. Meals are more often a festive, casual experience than a formal one. Many Iraqis were raised to feed their guests before themselves, and to feed them well. Most Iraqis hosts feel that they are failing in their role as hosts if their guests have not tried all of their dishes. In fact, proper appreciation is shown by overeating. A typical Iraqi meal starts with a mezze (appetizer), such as kebabs , which are cubes of marinated meat cooked on skewers. Soup is usually served next, which is drunk from the bowl, not eaten with a spoon. For gadaa and ashaa, Arabic for lunch and dinner, the meals are much alike. A simple main course, such as lamb with rice is served, followed by a salad and khubaz , a flat wheat bread served buttered with fruit jelly on top. Other popular dishes include quzi (stuffed roasted lamb), kibbe (minced meat, nuts, raisins, and spices), and kibbe batata (potato-beef casserole). Measure soy sauce, oil, lemon juice, ginger, pepper, and garlic into a large mixing bowl. This is marinade; reserve about 3 Tablespoons of it to use later. Add the meat cubes to the marinade in the mixing bowl, and stir to coat all the meat thoroughly. Cover the bowl with plastic wrap and refrigerate several hours or overnight. Prepare vegetables. Remove meat from the refrigerator, pour off marinade, and throw away. 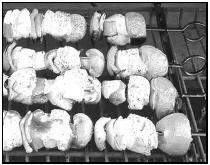 Assemble 6 kebabs by alternating meat cubes, green pepper, tomatoes, and mushrooms on skewers. Brush with the marinade you set aside earlier. Cook outdoors on a charcoal or gas grill, or broil in the oven, 3 to 4 inches from the heat source for 5 to 7 minutes. Brush with marinade (as needed) during cooking to prevent drying. Kebabs, shown here made with chicken, may be prepared using chicken, beef, or lamb. In Iraq, kebabs are most often made with lamb. Combine meat and onion in skillet. Cook and stir until meat is brown and crumbly. Add parsley, garlic, and season with salt. In a deep saucepan, cook rice with potatoes in water (enough to cover potatoes) until potatoes are tender (about 25 minutes). Drain potato mixture in a strainer. Return to saucepan. Add turmeric and season with salt. Mash until smooth. Spread half the potato mixture in a greased 13 x 9-inch baking pan. Spread the meat filling over potato layer. Top with remaining potato mixture. Dot with butter on top and bake for 30 to 40 minutes, or until golden. Many Iraqi households keep pastries, desserts, and candies on hand for snacks and as gifts to visiting friends. Desserts are a favorite among the Iraqis. They can include shirini (pumpkin pudding) and baklava , a pastry made of honey and nuts layered between paper-thin sheets of dough. However, only fruits, not sweets, are eaten at the end of a meal. Candied lemon, grapefruit, or orange peels called g'shur purtaghal are very popular. Once the meal has ended, Iraqis say to one another " sahtayn," which means "two healths to you." Using a sharp knife or vegetable peeler, carefully peel thin strips of grapefruit and orange rind (peel). Remove only the colorful part of the peel, leaving as much pith (the bitter white skin just under the peel) as possible. Save fruit for another use. Place the peels into a saucepan and cover with water. Bring to a boil and cook over medium to high heat, about 10 minutes. Drain in a strainer. Repeat this procedure 2 more times to remove the bitterness of the peel. Pour 1¼ cups water into medium saucepan. Add 1½ cups of the sugar and stir until dissolved. Bring to a boil. Reduce heat to medium and add peel. Simmer, stirring frequently, until the syrup is absorbed, about 45 minutes. Cover a cookie sheet with waxed paper and spray the waxed paper with the cooking spray. Arrange the peels on the papered cookie sheet and cool for at least 3 hours. Put remaining sugar into a plastic bag. Add the peels and shake until they are well covered. Place them an another piece of wax paper and let dry overnight. Serves 6 to 8 as a snack. A vegetable peeler or sharp knife works well to remove thin strips of the outer rind from grapefruit and oranges for G'shur Purtaghal (Candied Citrus Peel). When Iraq, led by Saddam Hussein, invaded Kuwait in 1990, it set off the Gulf War. The 15 member countries of the United Nations Security Council agreed to stop trading with Iraq (this action is called "imposing economic sanctions"). The countries hoped that if they stopped trading with Iraq, Saddam Hussein would feel pressure to cooperate with the other countries of the world. Because of the sanctions, no food was allowed to be imported into Iraq. The people of Iraq, particularly children, did not receive enough nutrition as a result. About 15 percent of the population of Iraq is classified as undernourished by the World Bank. This means they do not receive adequate nutrition in their diet. Of children under the age of five, about 12 percent are underweight, and more than 22 percent are stunted (short for their age). Dosti, Rose. Mideast & Mediterranean Cuisines . Tucson, AZ: Fisher Books, 1993. Middle East . Melbourne, Oakland, CA: Lonely Planet Publications, 2000. Osborne, Christine. Middle Eastern Food and Drink . New York: Bookwright Press, 1988. St. Elias Church Ladies Guild. Cuisine of the Fertile Crescent . Cleveland, OH: St. Elias Ladies Guild, 1993. Weiss-Armush, Anne Marie. Arabian Cuisine . Lebanon: Dar An-nafaés, 1993. Britannica.com. [Online] Available http://www.britannica.com/ (accessed April 6, 2001). Campaign Against Sanctions on Iraq. [Online] Available http://www.cam.ac.uk/societies/casi/guide/ (accessed April 6, 2001). Geocities.com. [Online] Available http://www.geocities.com/Athens/Ithaca/3291/index1.html (accessed April 6, 2001). IraqiOasis.com. [Online] Available http://www.iraqioasis.com/p4.html (accessed April 6, 2001). Refugee Service Center. [Online] Available http://www.cal.org/rsc/iraqi/ilife.html (accessed April 6, 2001).